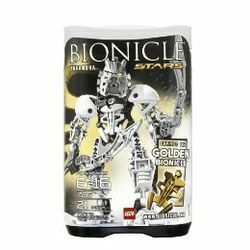 7135 Takanuva is one of the BIONICLE Stars sets that was released on November 14, 2009. The set contains 21 pieces to build Toa Takanuva. He wears the silver Kanohi Avokhii, Mask of Light, and he carries two twin light staffs. The last piece of this set is a piece of the golden armour, the chest armour. Takanuva was once Takua, a Matoran of Light in Karda Nui, before going undercover on the island of Mata Nui. He was the first Chronicler, following around various Toa and recording their adventures. He managed to get into quite a few of his own adventures, until he found a special Kanohi mask: the Mask of Light. While he and his friend Jaller, captain of the Ta-Koro guard and later a mighty Toa, searched for the rightful wearer of the Mask of Light, they battled Rahkshi and other menaces. Eventually, Takua realized he was the rightful wearer of the mask, so he put it on and became Takanuva, Toa of Light. Ever since, he has been helping the other Toa protect the Matoran workers, and fighting back against evil Makuta. Now, on the surface of Bara Magna, Takanuva helps Tahu and Gresh recover the scattered pieces of the golden armour. Although this is Takanuva in his light form, his Kanohi Avokhii is still silver, a sign that he has adapted his form to be less visible for Teridax. This is a description taken from LEGO.com. Please do not modify it. (see an archive of the product's page) The Toa of Light returns! Takanuva challenges hordes of evil Rahkshi with his twin light staffs and powerful Mask of Light. If he falls, two universes are doomed! Armed with twin light staffs and the Kanohi Mask of Light, Takanuva will make a last stand against the forces of darkness on Bara Magna. Includes one of six golden armor pieces. Takanuva, a BIONICLE hero, wields twin light staffs! Mask of Light and body armor included! The Toa of Light returns!